Country-style pork liver is an easy-to-make go-to meal that everyone enjoys at dinner or lunch. It is juicy, flavorful, and tasty, and chili peppers spice it up for a quick and healthy meal. It is not only ideal for a speedy lunch or brunch but fits into a low-carb diet perfectly and is nutritious at the same time. This is a wonderful combination of meat and seasonal vegetables, and your guests are sure to ask for the recipe. Whether you make country-style pork liver for close friends or on busy days, this recipe is a must-try. To make country-style pork liver, first rinse and clean liver very well to remove blood clots and then cut into cubes. Sprinkle with salt and ground black pepper to taste, roll in almond flour. Use a frying pan, melt butter, and cook on both sides until well done. Remove liver from the pan and set aside. Dice onion and saute for 3 - 4 minutes or until golden. Slice peppers and dice tomatoes and then add peppers first and tomatoes second. Saute until the water is reduced by half. 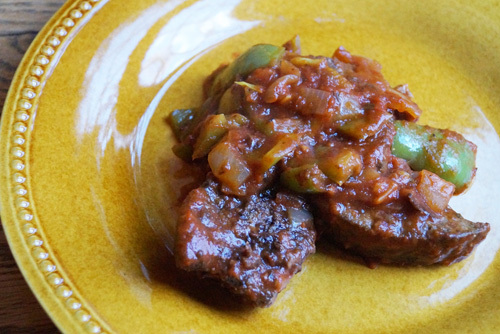 Distribute liver into serving plates and pour the warm mixture on top. Garnish with fresh parsley (finely chopped). Serve warm and add whole chili pepper to each portion for more flavor.